Great for lining the walkways in parks, downtown area and shopping malls. 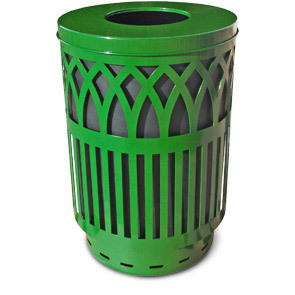 Encourage proper disposal of waste to help beautify the area while enhancing the over-all aesthetic with this sleek unique laser cut designed trash receptacle. With five lid options to choose from, you're sure to meet almost any environments' requirements. Each trash receptacle comes standard with a black high density rigid plastic liner, encapsulated lid security cable, ground anchor kit, 3 stainless steel leveling feet and 3 anchoring feet. The bottom ring is dipped in corrosion resistant plastisol for added durability and will match your chosen receptacle color.